House Painting, Charlotte, NC | Pride Painting, Inc.
We believe every house painting project should be done to the highest standards of quality. 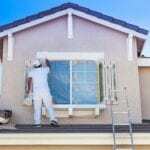 There is a common misconception out there that quality is not that important with exterior house painting because it only needs to look good from the street. At Pride Painting, Inc., we couldn’t feel proud of our work if you couldn’t stand right up next to it and deem it exceptional. We pay attention to the details regardless of whether we’re doing interior or exterior house painting. It would be a slippery slope to start thinking “good enough” would suffice. We didn’t earn our A+ rating with the Better Business Bureau by being sloppy or cutting corners, and we have every intention of maintaining that rating in the years to come by doing things right. With our more than 30 years of experience, we have learned what products perform well, what techniques get professional and lasting results, and how to maintain an organized worksite from start to finish. We back our workmanship with an unprecedented 3-year written guarantee, so you can feel confident that your Charlotte, North Carolina home will continue to look great. We want to add you to our growing list of satisfied customers who come back to us for house painting services and refer us to their friends and family. We are confident that once you have used our services once, you’ll be a believer that the pride we feel in a job well done sets us apart from other house painting professionals. Contact us today to learn more or to schedule an appointment for an estimate and/or color consultation for your interior or exterior house painting project.